Well hello readers! It’s been awhile, and we have been readjusting to home life and taking care of stuff that piled up while we were gone. We had Thanksgiving and Christmas, and it seems like so long ago that we were on the first leg of our road trip! Last week, we finally got to sit down and plot the second leg (a big trek through some of the Western US) and spent some time reflecting on the parks we visited in our first series. In case you need a refresher, so far we’ve seen Cuyahoga Valley, Acadia, Shenandoah, Mammoth Cave, Congaree, Everglades, Biscayne, Dry Tortugas, Great Smoky Mountains, and Hot Springs. We camped in three of the ten plus a state park during Government Shutdown Disaster Mode, stayed in a few hotels and hostels, and crashed on various friends’ and family members’ couches. We ended up driving down and back up the length of Florida twice, spending 16 anxious days wondering if the trip would continue or if we would have to pack it up and go home. We put over 6,500 miles on our car. On the road we met a diverse group of people: the hiker from DC who joined our climb up Precipice, the couple from out west who gave us some tips for the next leg of the trip, the fisherman who informed us that mullet are the craziest fish, the international residents of a funky hostel in Florida. We talked to passionate and informed rangers at every park and handed out business cards on busses. We stayed with a couple of branches of DA’s extended family and friends we hadn’t seen since high school or longer, and made spontaneous last-minute decisions about what to do during the shutdown. Life off the road is pretty different. We wake up in the same place every day, we have more than our suitcases of clothes to choose from, and we have a few more responsibilities. On the road, we mostly worried about staying on budget, setting up the tent before it got too dark, and finding hotels that weren’t too sketchy. At home, we worry more about shoveling snow, watering the plants, feeding the dogs, completing grad school applications, and getting to work on time. We have more options about what to eat- after all, we don’t have to cook over a camp stove or eat foods that survive at room temperature. And we sleep in real beds, with fuzzy blankets, instead of in three layers of clothing, hats, and gloves in a sleeping bag on the hard ground, or in strange hotel beds or hostel bunks. Much as we are creatures of comfort, we can’t help but feel restless with knowing how much more of the country we still have to explore. We look forward to touring the Pueblos at Mesa Verde, Old Faithful at Yellowstone, and finally seeing the Grand Canyon. We’ll drive a different coastline (or part of it anyway) and spend time in a much higher mountain range. We’ll snorkel in the Pacific off the Channel Islands, and spend days in desert parks for the first time. For now, though, we have to content ourselves with planning, imagining the warm sun of summer even while bundling up against February’s frigid cold. To take our minds off the icy chill that sets in every time we go outside, we’re planning on putting together a wrap-up video about the first leg of the trip – where you’ll get to see some different (and maybe slightly less professional) footage and hear our thoughts looking back on the journey so far. We would also love to include a Q&A from some of our readers. So if you have any questions about anything (life on the road, how we planned the trip, how we took video, editing) or if you have any feedback on our last series of videos (things we could do better, content you’d like to see, etc.) leave us a comment down below or e-mail thegaptrip@gmail.com! We hope you’re all staying comfortable during this somewhat ridiculous winter, and as always, we’ll see you on the road! 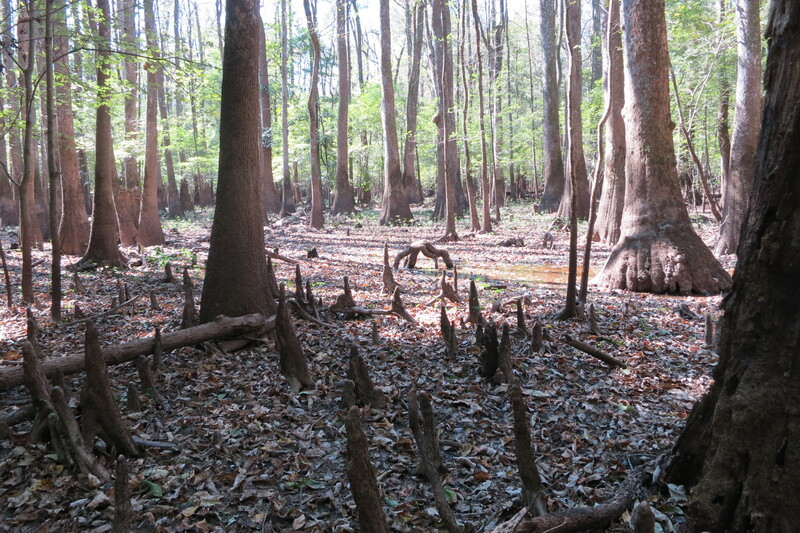 Congaree, Home of Cypress Knees! Congaree National Park is a floodplain with a lot of interesting tree and plant life! Click through for this week’s video.